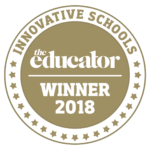 BGS has been named a winner in The Educator’s Innovative Schools awards. The awards recognise ‘those that are truly pushing the boundaries of education’. The School’s submission was based on its iDesign program, now in its eighth year. This year’s designs are yet to be revealed. Come to the iDesign Presentation Evening on 17 October (from 5pm) to see how your life could be improved by this year’s designs!